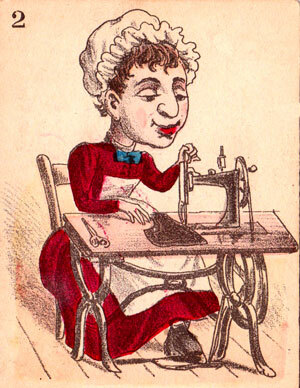 Some of the oldest cards still in existence come largely from Lyons, a city in which the craft of cardmaking flourished from an early date and which became an important centre of French card-making. 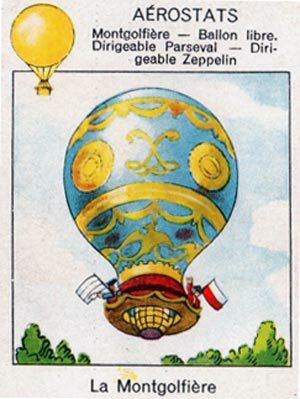 It seems that the provinces bordering on Italy and Germany were the first to produce playing cards. Indeed, an ordinance from Paris, 1377, forbade card games on workdays. Another ordinance from the city of Lille, dated 1382, when Lille belonged to France, forbade various games including dice and quartes (an early word for cards). 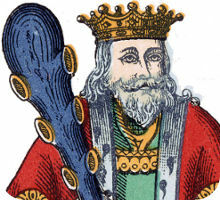 There is also the well-known account of a certain Jacquemin Grigonneur who in 1392 was paid 56 sols Parisis for three packs of gilded cards, painted with divers colours and several devices, to be carried to the king for his amusement. No-one knows what sort of cards these were. See also: The Dauphiné pattern The Genoese pattern. 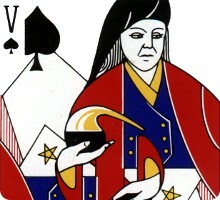 Right: fragment of uncut sheet containing red knaves. 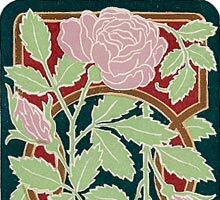 Much of the early history of cards in France is to do with standard designs and their spread, coupled with a keen sense of economic advantage. Having invented the French suit system (piques, coeurs, carreaux & trefles), which required only black and red, French manufacturers were able to introduce economies of labour which gave their products a competitive advantage. Jean de Dale (active 1485-1515), Jean Personne (1493-1497), Antoine de Logiriera (Toulouse, 1495-1518), Martial Gué (Limoges, c.1538) and Pierre Mareschal. 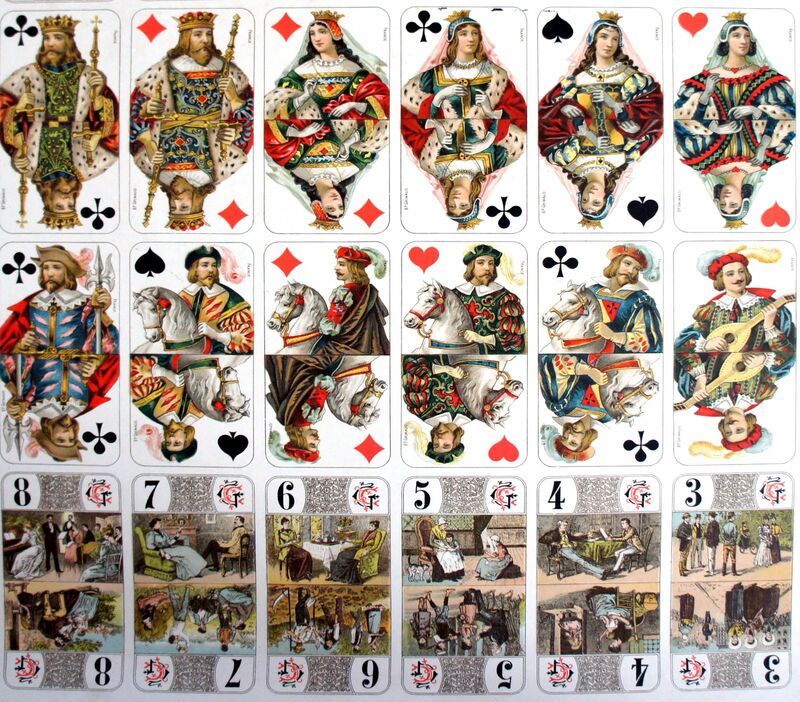 Several examples of cards by Jean Personne survive (see below right) in museums and libraries. French regional patterns, primarily originating in Paris, Lyons or Rouen, spread across Europe in all directions and many of their descendants survive. 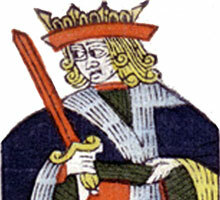 At an early period the French card makers introduced the practice of giving the names of famous heroes from the literature of antiquity or epic narratives of the age of chivalry to the court cards: Alexander, Julius Caesar, Charlemagne, David, Rachel, Argine, Judith, Pallas, Hector, Lahire, Lancelot and Hogier. 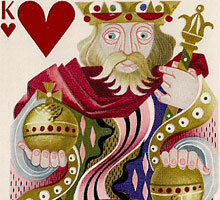 In each case a romantic story or legend is associated with the hero depicted on the card (see for example the blog of Jim McNeill). 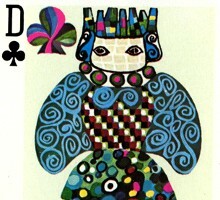 Right: four cards grabbed off eBay, designed by Jean Personne. 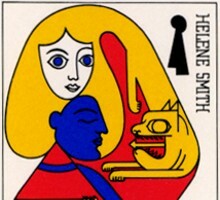 The cards carry inscriptions such as "Paris", "Melusine", "Conte de Chalou" and the maker's name, "Jhan Personne". These may have been replicas with some clumsy colouring applied, although no suit symbols have been added. Genuine copies of cards by Jean Personne are preserved in the Municipal Library at Dijon and the Cabinet of Engravings at Dresden. 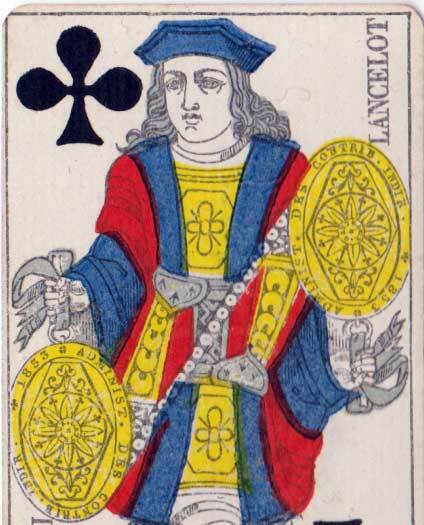 Some early French cards have Latin/Spanish suit symbols, as do some early German cards, and the queens are replaced by cavaliers. They were used for playing games such as Aluette. 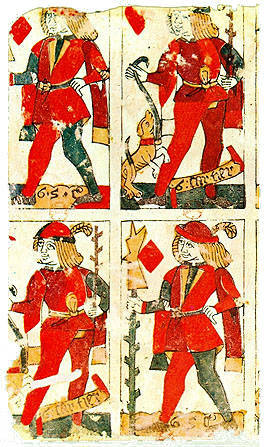 Spanish-suited cards reached many different places, having spread along trade routes of the time. 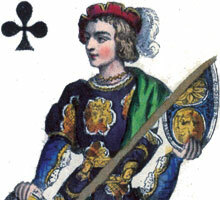 The only survivors among Spanish-suited cards in France today are Aluette cards (primarily of Brittany) and the French Catalan pattern of the Eastern Pyrenées. By the fifteenth century French suit symbols had crossed to England. 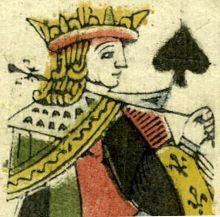 During the sixteenth century Rouen and Lyons became centres for the exportation of French playing cards, and from Rouen cards were imported to the British Isles and to the Netherlands and Germany. From England, of course, they spread to America and have become ubiquitous throughout the world. 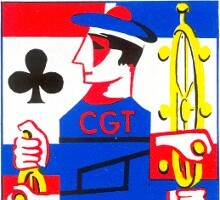 Playing cards very soon attracted the attention of the tax authorities in France. 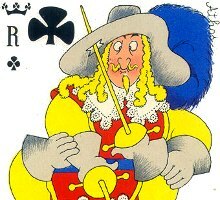 As early as 1613, Louis XIII decreed that cardmakers should place their name on the knave of clubs. 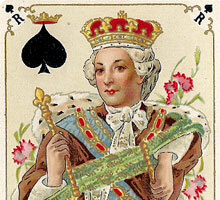 In 1701 a further law was passed in France laying down fixed designs for the playing cards from each of the nine regions, so that stereotyped playing cards from each region were produced which could be identified by the authorities. Some of the individual court designs reoccur in several different regional or even foreign (exported) patterns, sometimes reversed or with a different suit symbol. 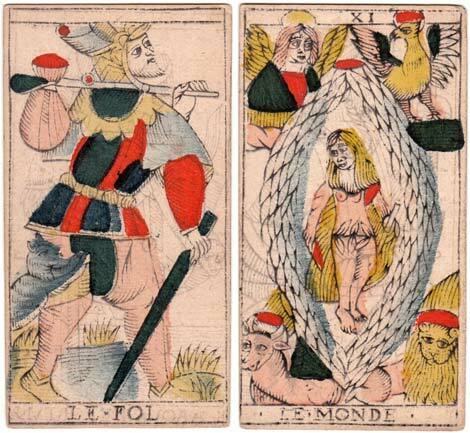 Tarot cards had arrived in France from Italy in the first half of the 16th century. 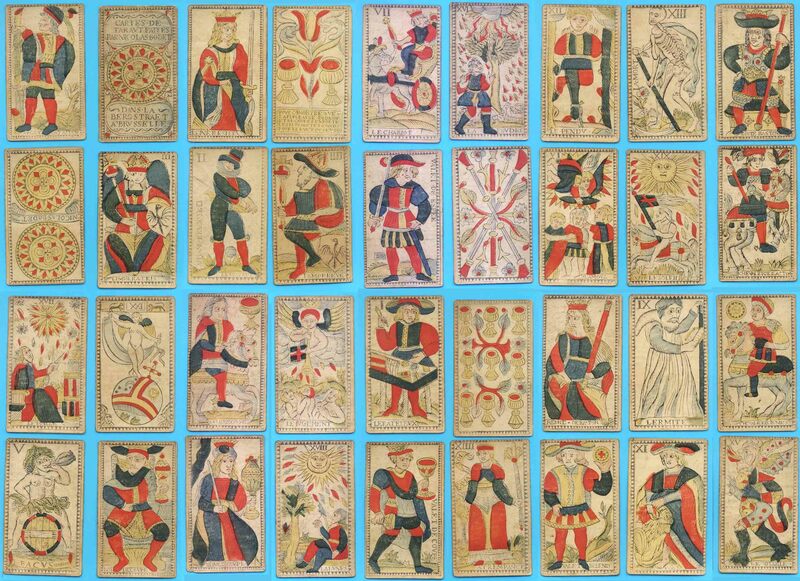 There appear to have been three standard tarot types in France: "Tarot de Marseille", "Tarot de Besancon" and "Belgian Tarot" but today most tarot games are played in France with the "Bourgeois Tarot". During the seventeenth century a number of attractive non-standard cards were issued, including educational and quartet games, heraldic or armorial cards and Geographical cards. 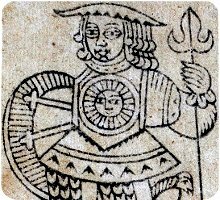 These have been followed more recently by important editions of cartomancy cards, several types of tarot cards and elaborately engraved costume cards. 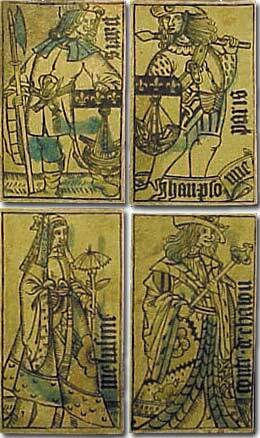 Above: Revolutionary figures on the court cards, end of 18th century. Stencil-coloured woodcuts, French suit signs. Images courtesy Dan Dragojevich. See also: French Revolutionary anti-Royalist playing cards, subtitled “Jeu des Philosophes de l’An II”, first published by the printer Gayant in Paris, 1793. Above: cards from a finely engraved deck by F. d'Alphonse Arnoult (Paris), c.1860. 52 cards. more →.